Today we are revealing more stamps from the Alison Bomber Collection. 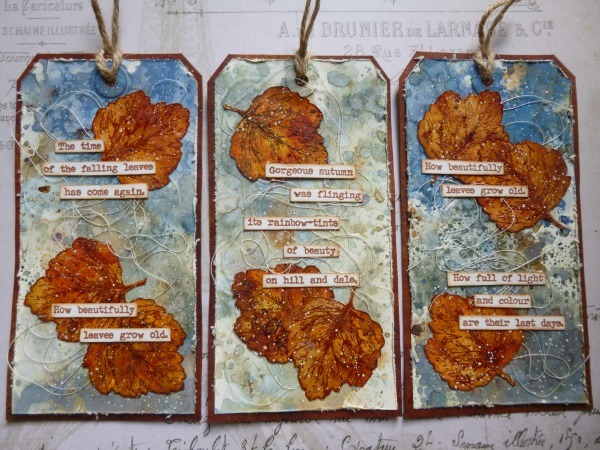 Alison creates plates with dedicated themes, and naturally, this release has a seasonal vibe. By keeping the font consistent, they seem to work particularly well with many other stamps from our numerous collections. She has a wealth of stunning ideas to share with you in this post! Techniques, products, genre - she has got it covered! What a thrill to be back with some more word stamps to share. Regular readers of my blog, Words and Pictures, will know that those two things - words and pictures - are equal obsessions of mine, and I can't describe how excited I am to have more quote stamps to play with. I loved seeing what people created with the first sets released in June, and I can't wait to see how these new collections inspire you. 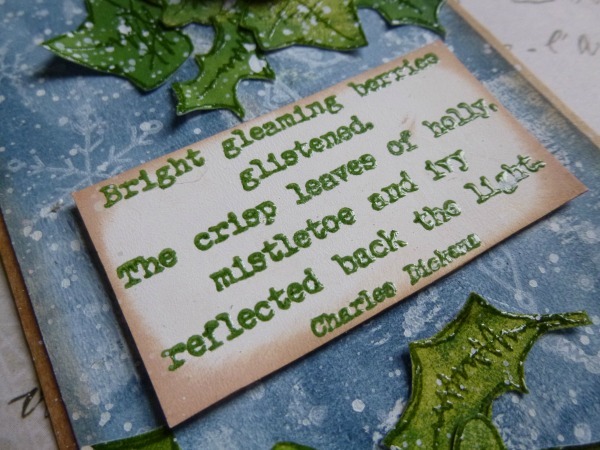 There are some seasonal quotes and phrases here, ready for when the nights start drawing in and certain festivals and holidays start looming - but these sets are not only for festive card-making. 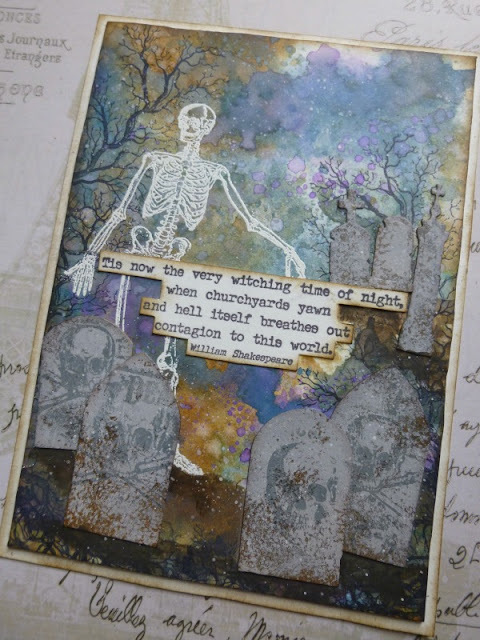 They are intended to be used for art-journalling, tags, scrapbooking, and all sorts of other projects; and all of them can be used more widely than just for Christmas or Halloween. The quotes are designed to be as flexible as possible, so that you can combine them with all styles and genres of stamps. As often seems to happen to me, I've ended up with lots of trios and pairs. I don't want to keep you here forever, so I'll be sharing everything in more detail at Words and Pictures over the coming days! Besides, you've got some spectacular inspiration still in store tomorrow, when the lovely Nikki Acton will be sharing her fabulous EAB samples with you. Let's take a look at the sets up close, and the possibilities within. 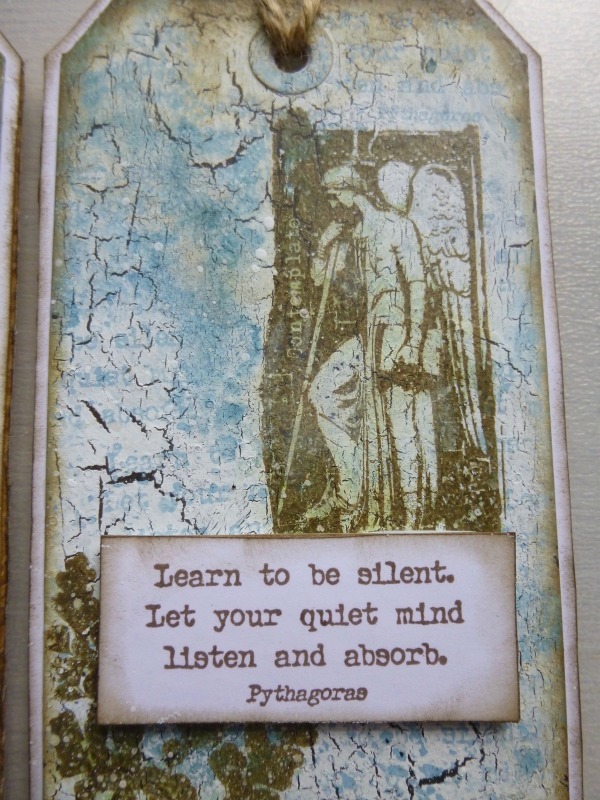 This first set EAB03 is called Music and Silence - and these are definitely year-round inspirational quotes. They are full of wisdom, contemplation and quite a bit of joy too, and some of my all-time favourite quotes appear here. 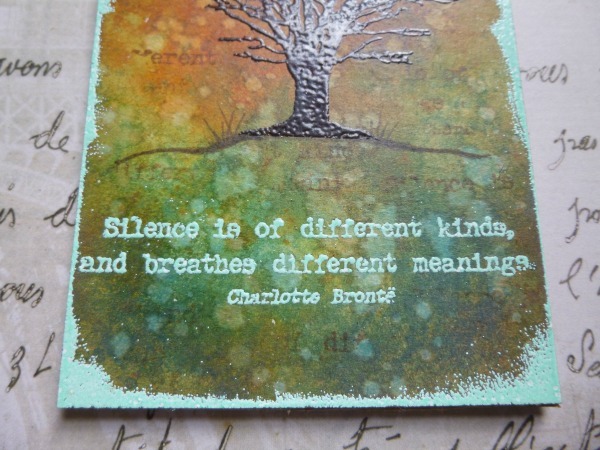 These tags have bold and colourful palettes, but the images and words are still full of serenity and gentleness. One of many things I love about these word stamps is that they refresh my thinking on all my other stamps. Images I know and love take on new life, and stamps which have been un-inked (we all have them!) suddenly become "necessary". It's only my second use of the tree from the Urban Snapshots Nature series but it has just the right contemplative mood for the Charlotte Brontë quote. 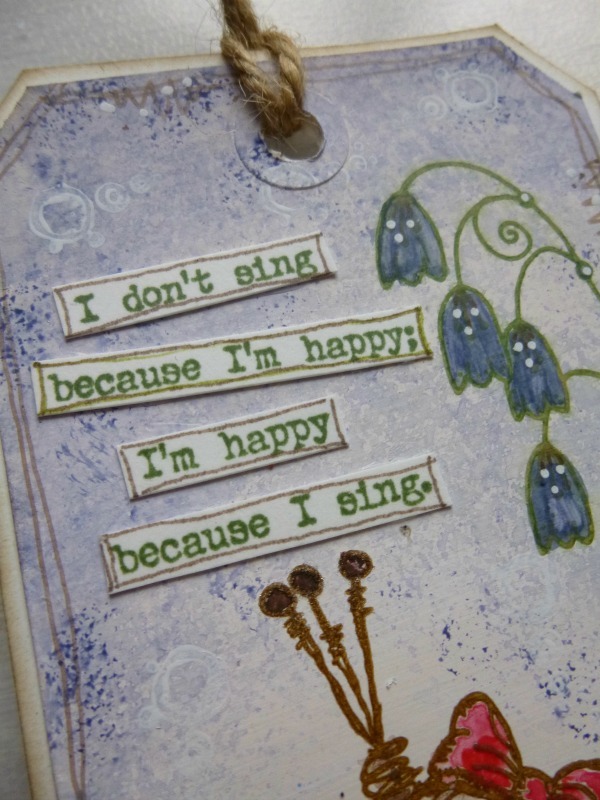 And the perennial PaperArtsy favourites of mine, the birds among the grasses (they come in various shapes and sizes in various sets, but this is from HP1005), are singing just the right song for the Mozart quote about notes and pauses. You'll see on many of the samples, I've also used the quote stamps to add extra background detail... a hovering echo of the main thought. 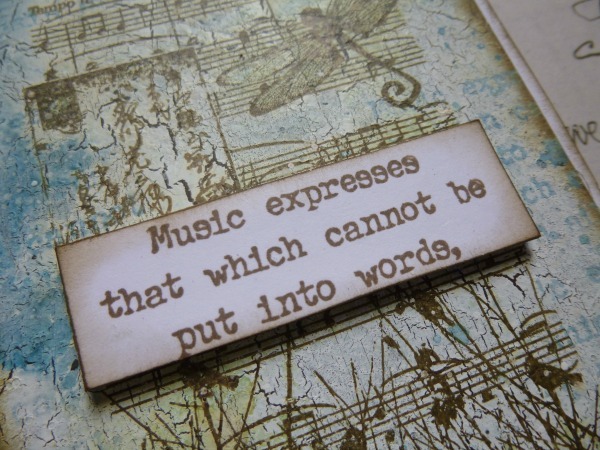 I love that the words can also be decorative. The next trio of tags found me in full-on meditative mode. The Crackle Glaze backgrounds give them an aged weathered look, and I gathered some beautiful stamps from Hot Picks and Urban Snapshots sets to suit the mood. This Pythagoras quote is one I definitely try to live by - just perfect with the contemplative Urban Snapshots statue, and I'm never happier than with some wild meadow grasses around. 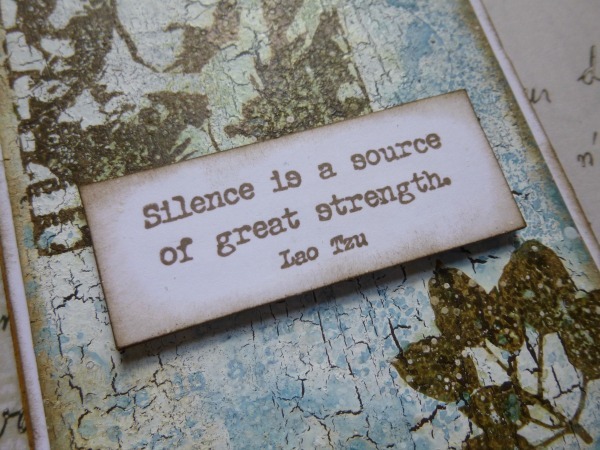 And there's some more deep wisdom from Lao Tzu to complete the set. 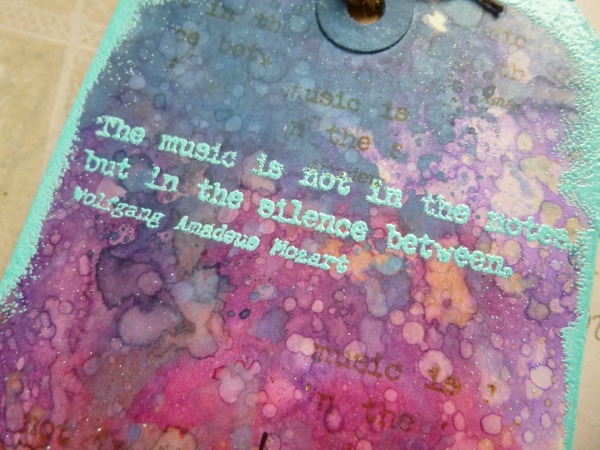 This Music and Silence set really comes from quite deep in my heart... it's no coincidence that when I'm crafting I want either complete peace or beautiful music! But this EAB03 Music and Silence set doesn't only have to be about solemnity, and it needn't get stuck in a vintage style. Look! I knew exactly who I needed for this brilliant William James quote about singing. I've been wanting to get hold of this happy little Zinski girl from ZA03 ever since she first appeared - and these words meant I finally had to indulge! Look at her loving life! Her twin and she have music either in their clothing or in the atmosphere all around them - a contrasting mix and match pair who make me really happy. 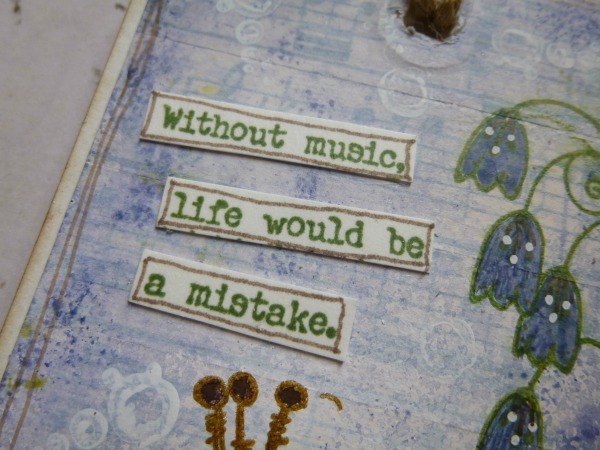 And I completely agree with her and Nietzsche about a life without music - it's also true of a life without crafting of course! This Autumn Edition is intended for all that gloriously colourful fall crafting which I love seeing everywhere at this time of year. 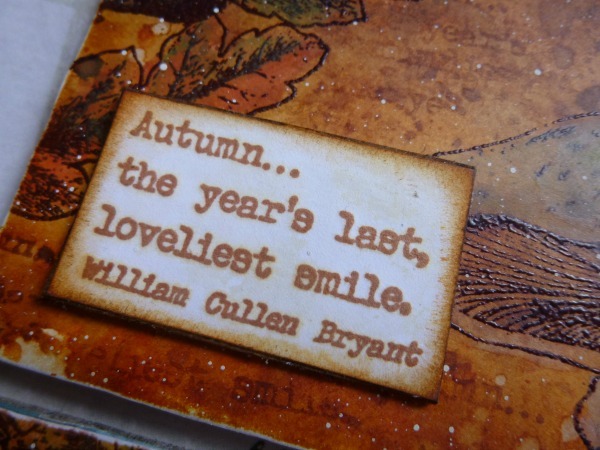 "Seasonal" is definitely the right word, as these are mostly quotes about the season of autumn - so they're good for harvest, maybe Thanksgiving, for art journalling about the changing season and the turning leaves; and there are a couple of downright spooky ones thrown in for all the Halloween fans out there. I paired these quotes with some of the glorious Scrapcosy stamps, mainly from the release earlier this year. This trio uses Scrapcosy ESC05. 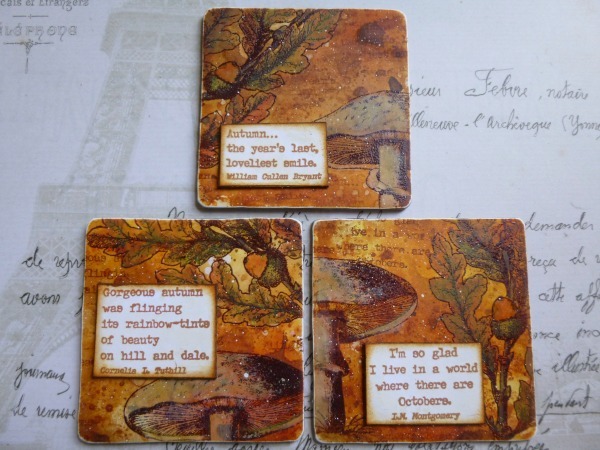 The autumnal fungi seemed perfect on this trio of coasters, and the burnished reds and golds reflect the words celebrating this most vivid of seasons. Of course the leaves of the oak branch can be painted to suit any time of year - but I guess that acorn gives away their true timing - that last, lovely smile of colour of autumn. You can always count on L.M. 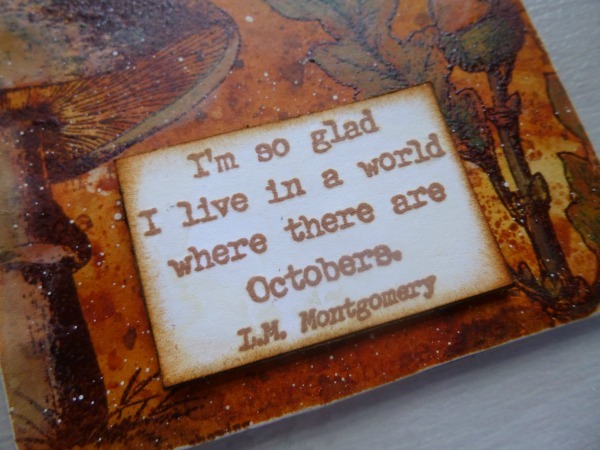 Montgomery and Anne of Green Gables for an uplifting thought about the end of summer! 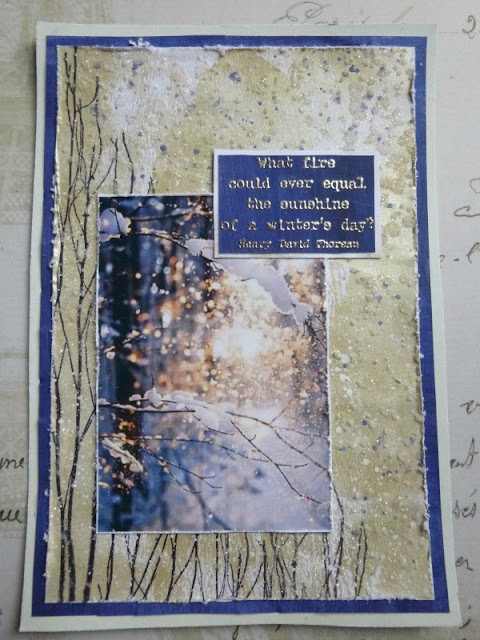 Oh, and there was some leftover background - enough for a little extra bonus ATC and some Robert Browning. As I mentioned, there are words which will work for the bounty of harvest and Thanksgiving, or just for a celebration of the fruits of the earth and the warmth of the sun. All these vintage vegetables are from Scrapcosy ESC02 (I'm hoping Raquel might add some fruits somewhere down the line!). 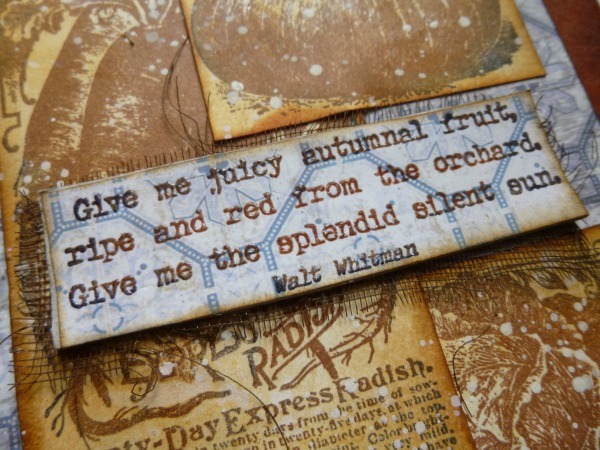 This Walt Whitman quote is one where I think you could cut it up and use just a line or phrase. On this next trio of tags, I did that with one of the longer quotes, and used it in sections. 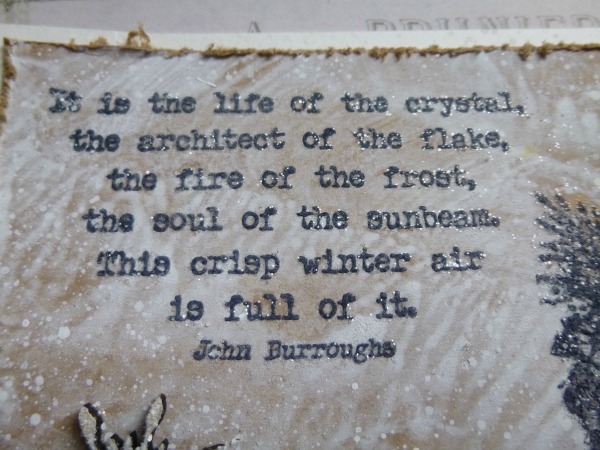 John Burroughs' words are incredibly beautiful (like the leaves he mentions) but you don't have to have all of them at once. You see the whole quote appear across the two outer tags, along with some more ESC05 leaves, tumbling through the Oxide skies. 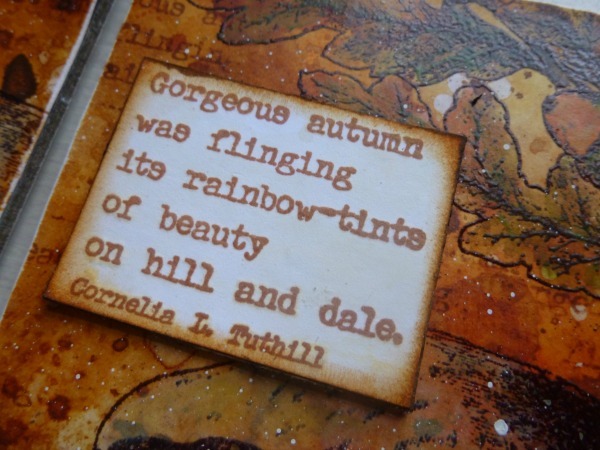 And Cornelia L. Tuthill puts in another appearance on the centre tag - I'm so inspired by these words - but here without her name attached. You can decide for yourself whether you want to have the author put in an appearance - the words work just as well without! 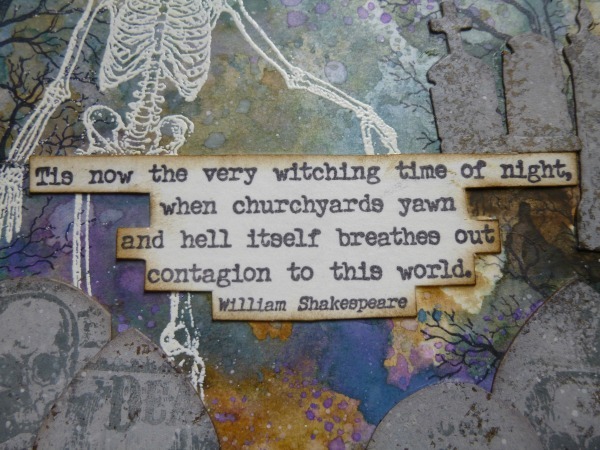 This quote is from Hamlet, and I think the combination of the Scrapcosy ESC06 skeleton and bare twiggy branches, along with these HP Halloween05 infested gravestones and those Shakespearean words should be enough to raise the hairs on the back of anyone's neck! Finally, let me introduce you to EAB05 The Winter Edition. Like the autumn one before it, this is designed to summon up thoughts of the wintry season - frost and snow - rather than being all about Christmas. There are, of course, some specifically festive quotes here, but there are also plenty to use in art-journalling or wintry scrapbooking layouts, as well as on cards, or as prompts for written journals. 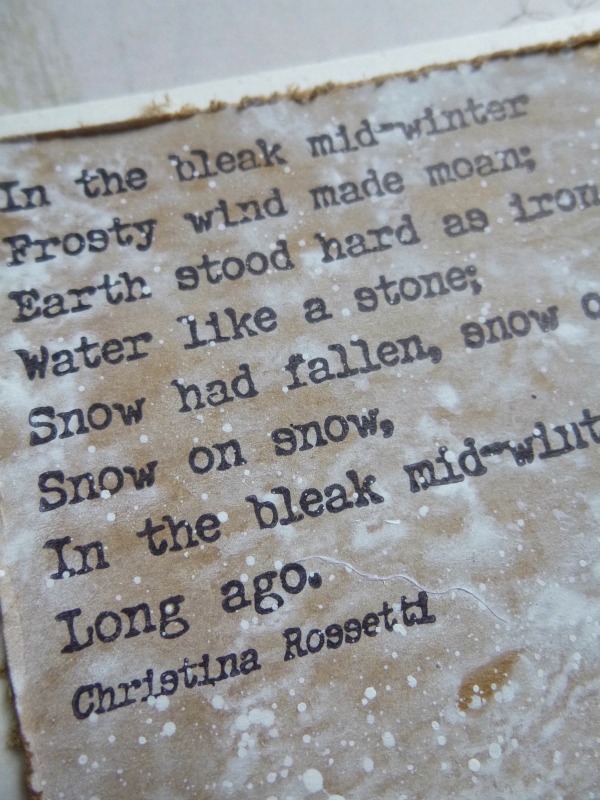 I had to have Christina Rossetti's words from probably my most-loved Christmas carol. 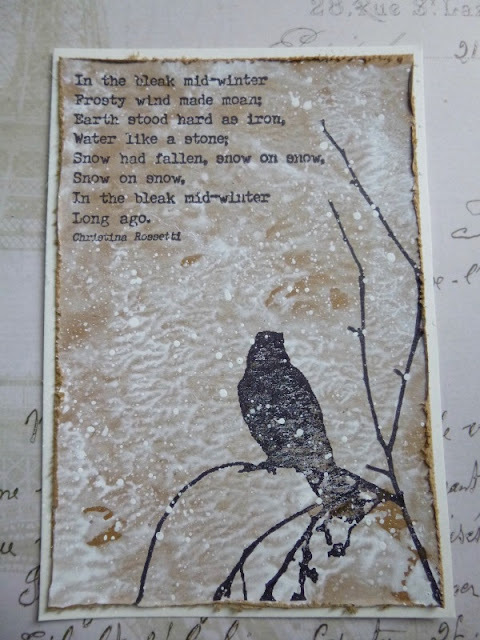 I've used them in their entirety on this extremely simple card front with Sara Naumann's beautiful bird and twigs from ESN18, but you could just use a line or two at a time. If you prefer something a little jollier, how about some JOFY? 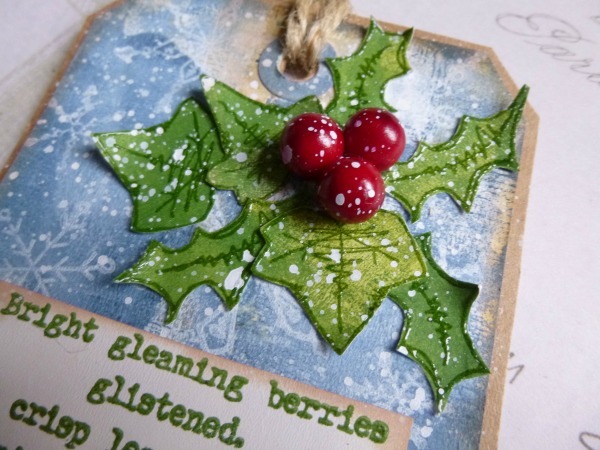 These words love to play with any kind of stamps - and they can go from bleak midwinter to bright berries in an instant. Here are the snowflakes from JOFY48 along with the leaves from JOFY Mini28. 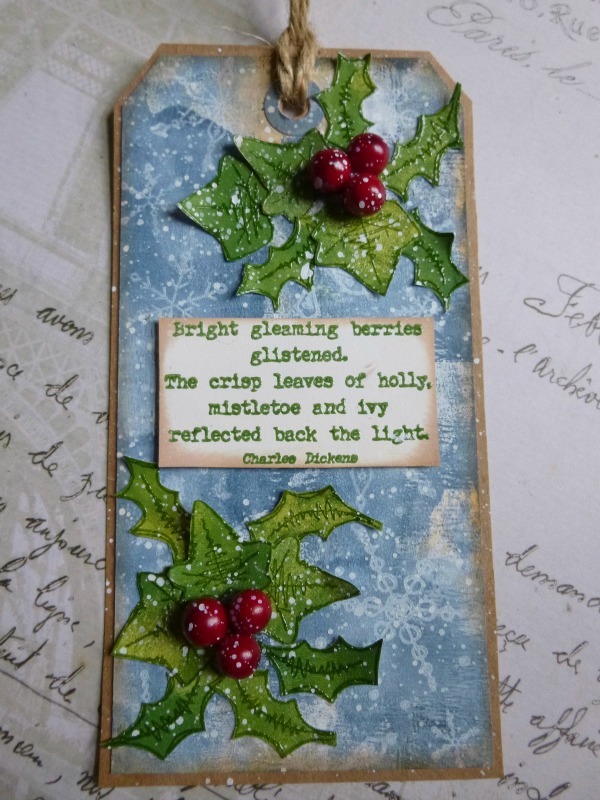 One of my favourite things is to emboss quotes for extra shine and a touch of dimension - and I love how they catch the light, just like the glossy berries. 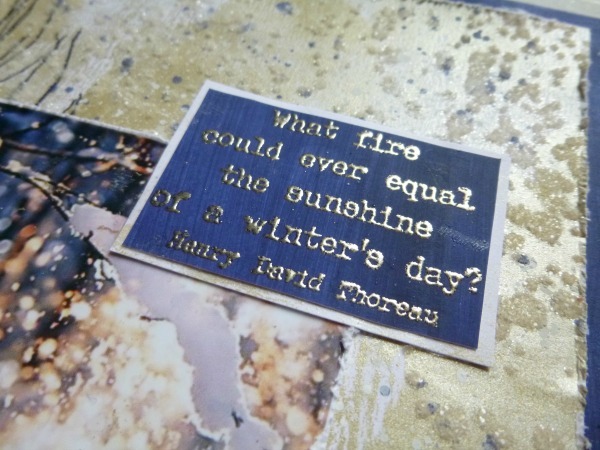 Speaking of catching the light, I went for some real sparkle to reflect the ideas in this next quote. Both the words and the fabulous Lynne Perrella snowflake woman are frost-embossed to try to capture the "life of the crystal". ... so that you can see how the "fire of the frost" sparkles as it moves. Again, I've used the whole quote, but I can imagine using individual phrases from this one - that's why I made sure they have a line each, for easy cutting up. 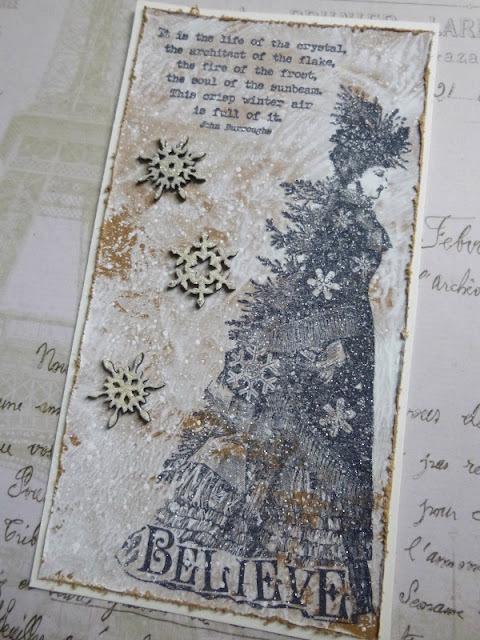 There's more sparkling snow on this next card, and gleaming metallic paint as well as gilded embossing. I wanted to create something to echo this fabulous photo I found online, and then I thought, "well, why not just use the photo?". 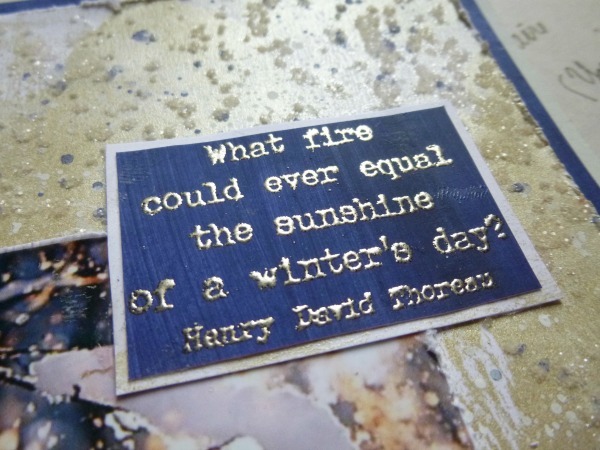 And Henry David Thoreau's words are some of my favourites. They lift my spirit towards those vivid blue skies of winter and the exhilaration of that icy air in the throat. 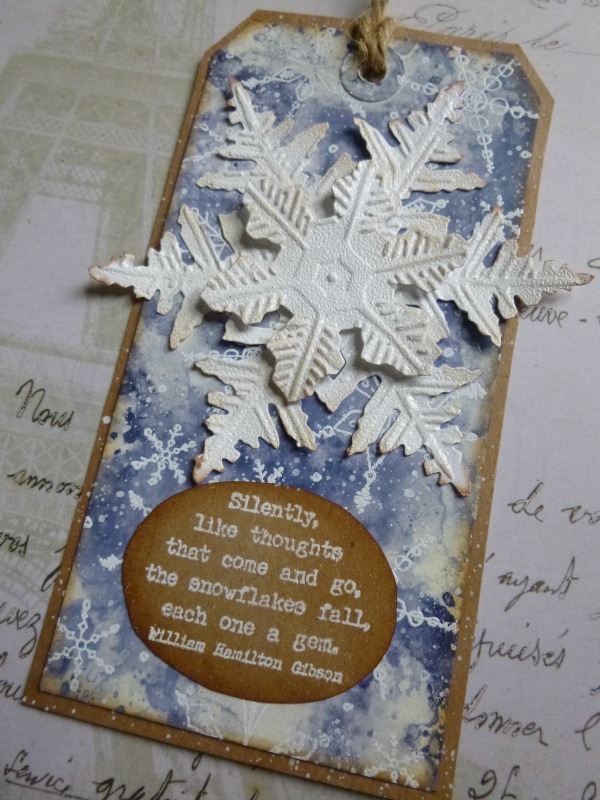 There are more JOFY snowflakes in the background of this next tag with its 3D die-cut embellishment. The magic of a snowflake caught in words, pictures and three dimensions. So I hope you can see that these stamps will play nicely with all sorts and styles of stamps, as well as with die-cuts, photos and just about anything else you can think of. Nikki’s delicious samples tomorrow will offer up even more possibilities. I know, I know… I talk too much - and so many photos, sorry! - but I got carried away again. I'm buzzing with ideas for more projects, and I hope these new words will fire your creative imaginations too. oh, perfect; Alison - some fantastic additions to the quotes. As for the tags and projects... they are just beautiful!! Woooohooooooo. 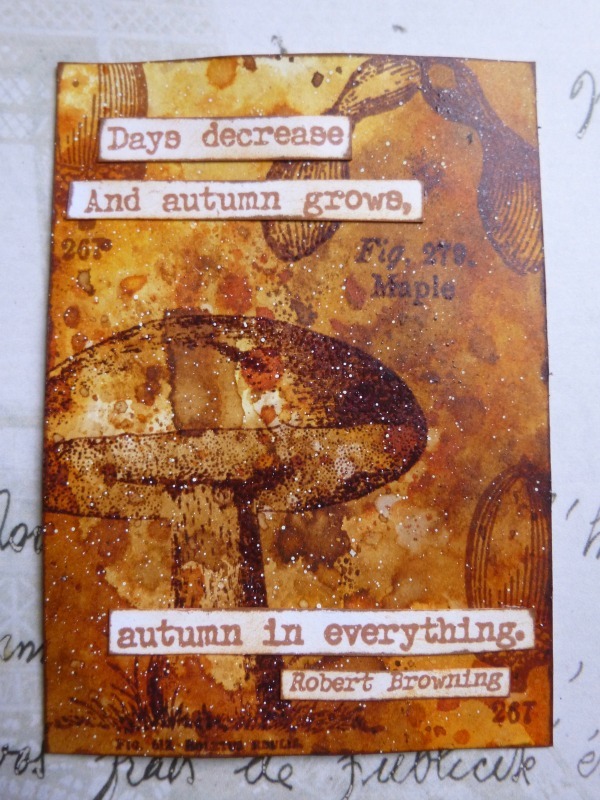 I lurve your stamps and your samples are FANTABULOUS!!! Wicked!!! Congratulations!! 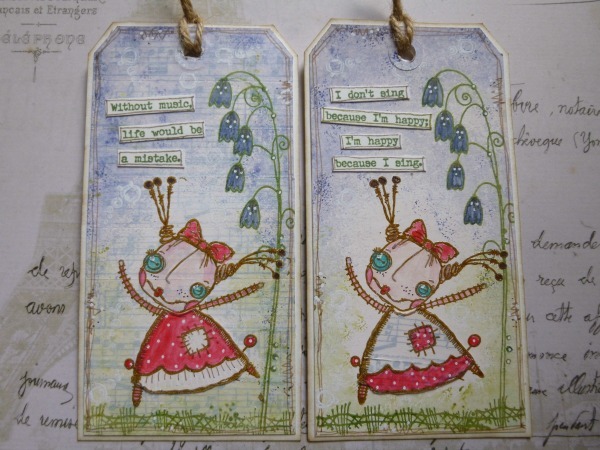 Absolutely adorable quotes - those sets are amazing and your samples are a delightful ! Just GORGEOUS!!! Oh my goodness me, Alison...what a feast of stamps and images. I love the range of the pieces you have made. 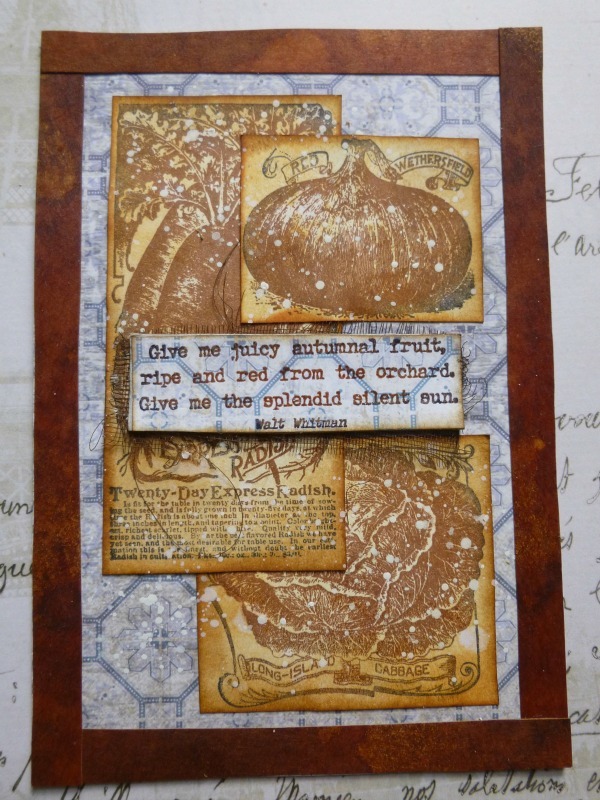 Congratulations Alison, the new stamp sets are great and your samples are beautiful. Congratulations dear Alison,-- oh so many amazing creations, they each fill me with joy for the seasons , an d the beauty you have created again-- the quotes you collected are so very beautiful as well, and gives to every tag and creation something very very special, a deeper meaning , and gorgeousness . 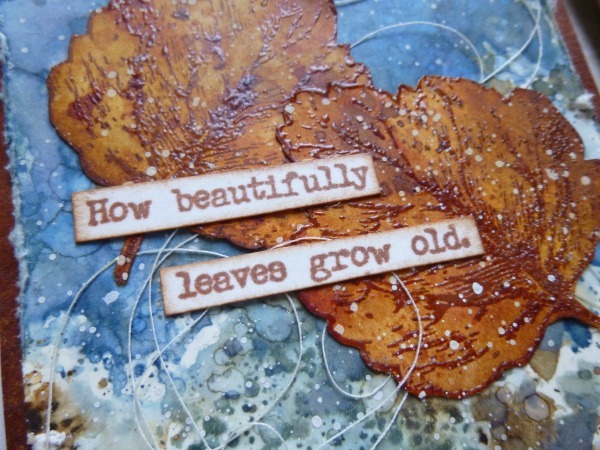 Totally amazing creations with your beautiful new quotes Alison and so many wonderful words to choose from too. You've really spoilt us this time so thank you to you and Leandra for such fabulous new stamps. Well chosen words Alison! The samples are fabulous too! Wonderful new quotes and beautiful samples Alison! I have honestly never seen so many amazing samples all from the same person, my mind is blown!!! Another marvellous collection of quotes brought to life with a fabulous array of samples. Wonderful quotes and GORGEOUS artwork. 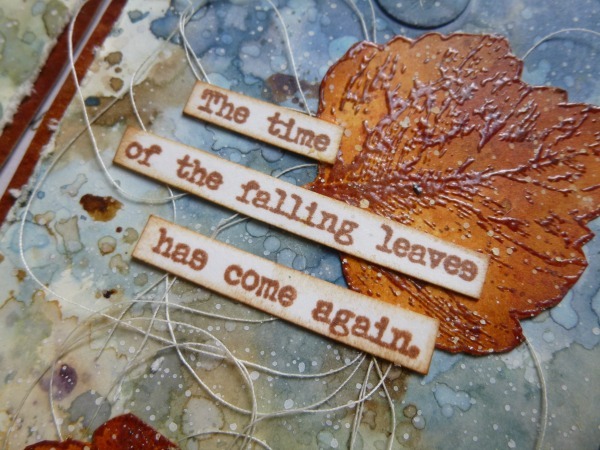 Another wonderful collection of quotes and fabulous samples! Perfect additions Alison, really enjoyed looking at all your peeks of inspiration. A catalogue of seasons!! Definitely on my wish list. Huge Congratulations ! Alison on yet another fabulous NR. 3 wonderful collections of quotes . Your samples showcase them just perfectly and thoroughly enjoyed reading and seeing your post . So so happy for you . 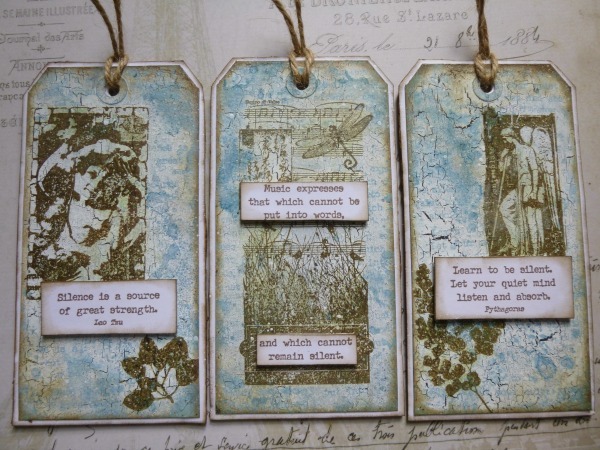 Totally fabulous new quote stamps, and exquisite samples with them all Alison, wow wow and WOW again!!! Alison, first of all, huge congratulations on these beautiful word stamp collections. They are simply amazing and I LOVE each of them! Your samples you have featured are also beautiful and so YOU. Love everything!! Absolutely stunning samples, and fantastic quotes! 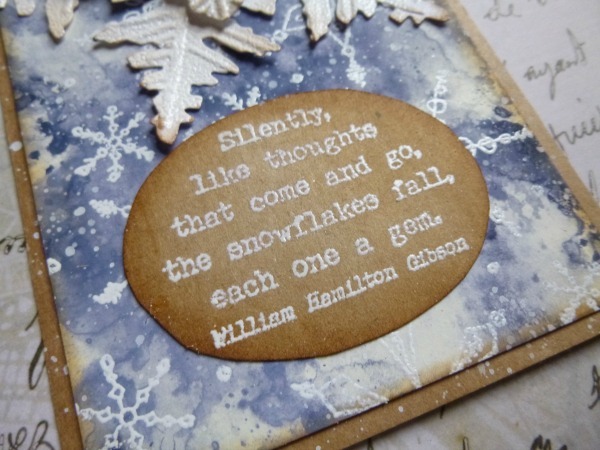 I just love your choice of quotes for your new stamp sets, Alison! Your samples are stunning! omg, these new quotes are great, more for the wish list! 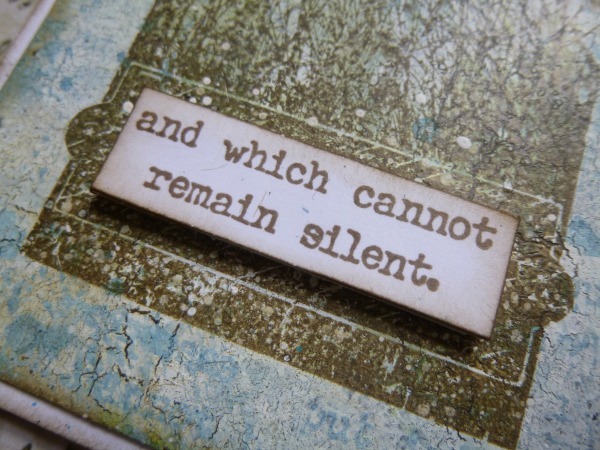 So many beautiful creations around your quote stamps... The choice of the colours and the designs are perfect and wonderfully open to thought and inspiration... Thanks! 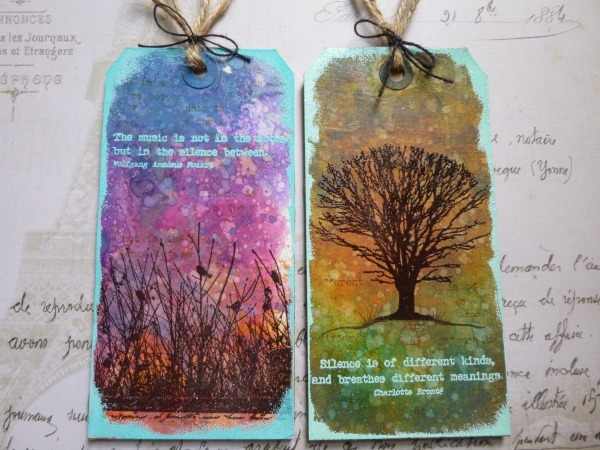 Wonderful quote stamps! I love the samples, especially the sparkly snowflake woman, the winter bird, and the skeleton one. Alison, your words are inspiring, as you've proven with your samples! Such mind blowing artwork, each and every one! What a feast for the eyes, all this is one amazing post! Congratulations on your new stamps Alison! These are fabulous words and your artwork is simply outstanding! Fabulous quotes Alison, and such an amazing array of samples.